PLEASE READ THESE TERMS AND CONDITIONS OF USE CAREFULLY BEFORE USING OUR PLATFORMS AND RELATED WEBSITES. Catalia Health, a Delaware corporation with its principal offices in San Francisco, CA (“we” or “us”), provides you with the Mabu Wellness Companion Robot (the “Mabu WCR”) and related websites (including the mobile-optimized versions of such website, the “Sites”) and the Short Message Service (SMS) Application (the SMS program) under these Terms and Conditions (this “Agreement”). The Mabu WCR, the Sites, and the SMS Program are referred to together as the “Platform.” By using the Platform and/or by clicking the “I Agree” button, you unconditionally agree to follow and be bound by this Agreement. If you do not agree to be bound by and comply with all of the terms of this Agreement, you may not use our Platform. Use of and access to the Platform is void where prohibited. By accessing and using the Platform, you represent and warrant that (a) any and all registration information you submit is truthful and accurate; (b) you will maintain the accuracy of such information; and (c) your use of the Platform will comply with and does not violate any applicable law, regulation, order or guideline. We reserve the right to update or modify this Agreement, at any time and for any reason, without penalty or liability to you or any third party. By continuing to use the Platform after any such changes, you unconditionally agree to follow and be bound by this Agreement as changed. For these reasons, we encourage you to periodically review this Agreement. We will notify you about changes to these terms and conditions, either by email, text message, or through Mabu conversation. Your use of any aspect of the Platform is at your own risk. You must consult with healthcare providers and make your medical decisions based on their advice. We cannot and do not accept any liability in respect of any activities that you may undertake through using the Platform. WE MAKE NO REPRESENTATIONS OR WARRANTIES WHATSOEVER IN RESPECT OF THE PLATFORM. INFORMATION REGARDING MEDICATIONS, TREATMENT, HEALTH AND OTHERWISE MAY BE PROVIDED BY THIRD PARTIES, INCLUDING OTHER USERS OF THE PLATFORM. WE CANNOT ACCEPT ANY LIABILITY WHATSOEVER IN RESPECT OF ANY CONTENT WHICH IS PROVIDED BY THIRD PARTIES AND/OR ANY OTHER USERS OF THE PLATFORM. ANY ACTIONS YOU TAKE BASED ON CONTENT, NOTIFICATIONS AND OTHERWISE PROVIDED BY THE PLATFORM ARE TAKEN AT YOUR SOLE RISK AND WE WILL NOT ACCEPT ANY LIABILITY IN RESPECT THEREOF. YOU SHOULD ALWAYS CHECK ANY INFORMATION PROVIDED THROUGH THE PLATFORM TO ENSURE ITS ACCURACY. TO THE MAXIMUM EXTENT PERMITTED BY APPLICABLE LAW, THE PLATFORM IS PROVIDED ON AN “AS IS” AND “AS AVAILABLE” BASIS. WE MAKE NO REPRESENTATIONS OR WARRANTIES OF ANY KIND, EXPRESS OR IMPLIED, AS TO THE OPERATION OF THE PLATFORM OR ANY INFORMATION, CONTENT, MATERIALS OR PRODUCTS INCLUDED OR REFERENCED THEREIN. TO THE FULL EXTENT PERMISSIBLE BY APPLICABLE LAW, WE DISCLAIM ALL WARRANTIES, EXPRESS OR IMPLIED, INCLUDING, BUT NOT LIMITED TO, IMPLIED WARRANTIES OF MERCHANTABILITY, NON-INFRINGEMENT OF THIRD PARTIES’ RIGHTS AND FITNESS FOR A PARTICULAR PURPOSE. YOU ACKNOWLEDGE THAT YOUR USE OF THE PLATFORM IS AT YOUR SOLE RISK. WE DISCLAIM ANY IMPLIED OR STATUTORY WARRANTIES (I) REGARDING THE SECURITY, ACCURACY, RELIABILITY, TIMELINESS AND PERFORMANCE OF THE PLATFORM; OR (II) THAT THE PLATFORM WILL BE ERROR-FREE OR THAT ANY ERRORS WILL BE CORRECTED; OR (III) REGARDING THE PERFORMANCE OF OR ACCURACY, QUALITY, CURRENCY, COMPLETENESS OR USEFULNESS OF ANY INFORMATION PROVIDED BY THE PLATFORM. WE DO NOT WARRANT THAT ANY DESCRIPTION PROVIDED THROUGH THE PLATFORM REGARDING MEDICATIONS OR OTHERWISE IS ACCURATE, COMPLETE, RELIABLE, CURRENT, SAFE OR ERROR-FREE. NO COMMUNICATION, INFORMATION OR ADVICE GIVEN BY US OR ANY REPRESENTATIVE OF OURS, WHETHER WRITTEN OR ORAL, SHALL CREATE ANY WARRANTY. IF YOU CHOOSE TO RELY ON SUCH INFORMATION, YOU DO SO SOLELY AT YOUR OWN RISK. SOME STATES OR JURISDICTIONS DO NOT ALLOW THE EXCLUSION OF CERTAIN WARRANTIES. ACCORDINGLY, SOME OF THE ABOVE EXCLUSIONS MAY NOT APPLY TO YOU. THIS DISCLAIMER CONSTITUTES AN ESSENTIAL PART OF THIS AGREEMENT. In order to use the Platform, you must have a Mabu WCR, the Mabu WCR must be capable of obtaining a cellular signal, and you must be enrolled in a Program. You should not and must not rely on the Platform as your primary tool for determining whether and when to take medication, for information about your treatment, disease progression, or other health information. As further described under “Technology; Support” below, the Platform might not function as intended. Specifically, the Platform will not function properly if your device is broken or powered off, if the Platform cannot access the Internet because of a weak or nonexistent cellular connection, or if the Mabu WCR has been modified in any way after it has been shipped to you. You acknowledge that the Platform, and the utility of any of its content, depends on information that you input into the Platform. You are solely responsible for ensuring that the correct medication is taken at the proper times and in the proper dosages. Persons using the Platform assume full responsibility for the use of the Platform and agree that we and our Partners are not responsible or liable for any claim, loss, or damage arising from the use of the Platform. Information, advice, recommendations, messages, comments, posts, text, graphics, software, photographs, videos, data and other materials is made available from us or third parties, including other users, through the Platform (collectively “Content”). For example, the interface of the Platform may provide you with names, pictures or descriptions of various medications. The Platform does not guarantee and are not responsible for the accuracy, completeness, or timeliness of any Content. All Content is provided for informational purposes only. No Content, including that provided by other users of the Platform, is or should be considered, or used as a substitute for, medical advice, care, diagnosis or treatment. the Platform does not constitute the practice of any medical, nursing or other professional health care advice, diagnosis or treatment. We do not prescribe, dispense, or refill prescriptions. The provision of information about or the enablement of the reminder system with respect to any drug or product is not a recommendation or endorsement by us for such drug or product. While we may provide you with certain functionalities that may alert you regarding certain drug-drug interactions, there may be other interactions which are harmful and to which we do not alert you. Please consult with your health care provider with respect to any drug-drug interactions. The absence of a warning for a given drug or drug combination does not and should not be construed to indicate that a drug or drug combination is safe, appropriate or effective for you or anyone else. Furthermore, the Platform is not intended to provide any dosing information, and we are not responsible for any errors in dosages taken. Reliance on any Content or other information provided by us, our employees, our users or third parties through your use of the Platform is solely at your own risk and we accept no liability therefor. Always seek the advice of your physician or other qualified healthcare provider with any questions you may have regarding personal health, medical conditions or drugs or medications and before commencing or discontinuing any course of treatment, drug or medication. Never disregard, avoid or delay in obtaining medical advice from your doctor or other qualified health care provider because of any information you have received or obtained through the use of the Platform. If you have or suspect that you have a medical problem or condition, please contact a qualified health care professional immediately. If you are experiencing a medical emergency, please immediately call for emergency medical help. THE SERVICE IS NOT INTENDED TO (AND DOES NOT) CREATE ANY PATIENT RELATIONSHIP BETWEEN CATALIA HEALTH AND YOU, NOR SHOULD IT BE CONSIDERED A REPLACEMENT FOR CONSULTATION WITH A HEALTH CARE PROFESSIONAL. YOU SHOULD NEVER DISREGARD MEDICAL ADVICE OR DELAY SEEKING MEDICAL ADVICE BECAUSE OF SOMETHING YOU HAVE READ ON OR HEARD FROM THE PLATFORM OR THE RESULTS YOU RECEIVE THROUGH THE PLATFORM. IN ADDITION, YOU UNDERSTAND AND AGREE THAT IN PROVIDING THE PLATFORM WE RELY ON A NUMBER OF THIRD PARTY PROVIDERS, INCLUDING FOR PURPOSES OF SENDING PUSH NOTIFICATIONS, AND HEREBY DISCLAIM ANY LIABILITY WITH RESPECT TO THE SERVICES PROVIDED BY SUCH PROVIDERS. YOU SHOULD NOT RELY ON THE SERVICE FOR ANY LIFE-THREATENING CONDITION OR ANY OTHER SITUATION WHERE TIMELY ADMINISTRATION OF MEDICATIONS OR OTHER TREATMENT IS CRITICAL. If you have an unexpected or negative reaction (or “Adverse Event”) that may be related to the use of a medical product, it is important that you inform your doctor. You agree that the Platform can send information related to Adverse Events you disclose to the Platform to Partners. These entities may follow up on this information with you, generally by calling you in order to get more information. You can also report the problem to the United States Food and Drug Administration (FDA) at http://www.fda.gov/medwatch/index.html. References or links within the Platform to any third parties or their websites or information are provided only for your convenience and do not in any way mean that we endorse, sponsor or recommend any third-party material, product or service. We do not make any representations regarding the content, accuracy, completeness, decency, legality, non-infringement, quality or any other aspect of material on such third-party websites, content, data, information, applications or materials. We are not responsible for and do not assume any liability with respect to the content, privacy practices or otherwise of third parties. As part of our services, our Platform may send out up to three SMS text messages per day to you on your mobile device. If you agree to receive text messages, the following terms and conditions will apply. After opting in to receive SMS text messages, subject to the terms and conditions of your mobile carrier, you will receive text messages sent to your mobile phone. Catalia Health does not have a separate charge for this service; however, message and data rates may apply from your mobile carrier. By providing your consent to participate in this program, you approve any such charges from your mobile carrier. Charges for text messages may appear on your mobile phone bill or be deducted from your prepaid balance. Catalia Health reserves the right to terminate this SMS service, in whole or in part, at any time without notice. The information in any message may be subject to certain time lags and/or delays. If you have any questions or need help, reply to received text messages with SUPPORT. To stop receiving text messages, text STOP, STOP ALL, END, QUIT, CANCEL, or UNSUBSCRIBE to the number from which you received the text message. By using the Platform, you consent that following such a request to unsubscribe, you may receive one (1) final message from Catalia Health confirming that you have been inactivated in our system. Following such confirmation message, no additional text messages will be sent unless you re-activate your usage of the SMS portion of the Platform. Catalia Health may use an automatic dialing system to deliver text messages to you. By your use of the Platform, you give your consent to Catalia Health to use an automatic dialing system to deliver text messages to the telephone number(s) to which you have directed Catalia Health to transmit these text messages. You also consent to receiving text messages derived from automatic telephone dialing systems from our Partners and affiliated third parties (including any third-parties we control) regarding your health treatment. You agree to indemnify Catalia Health, Partners, and their vendors, service providers, and parties calling or texting on their behalf in full for all claims, expenses, and damages related to or caused in whole or in part by your failure to notify us if you change your telephone number, including but not limited to all claims, expenses, and damages related to or arising under the Telephone Consumer Protection Act. If you change your telephone number, you agree to notify Catalia Health and other applicable parties promptly by the technical support number provided to you in the one page setup insert provided with the Mabu WCR. You may register to use the Platform by providing your name and other Personal Information to the Platform and/or a Partner. We may change the method of registration at our discretion. We might refuse to allow any user to open an account for any reason at our sole discretion. You agree to supply accurate and complete information to us when creating your account and when using the Platform, as well as to update such information promptly after any change. You will be responsible for any inaccuracies in the information you provide to us, or for your failure to keep such information up-to-date. Do not share your account or login information with any third party, nor let any third party access your account. You are fully and solely responsible for maintaining the confidentiality of the login information for your account and for the security of your computer system, mobile device and all activity on your account, even if such activities were not committed by you. We may terminate your account if you let someone use your account inappropriately or if you or anyone using your account violates this Agreement. You agree to immediately notify us of any unauthorized use of your account. We will not be liable for any losses or damage arising from unauthorized use of the Platform, and you agree to indemnify and hold us harmless for any improper or illegal use of the Platform, and any charges and taxes incurred, unless you have notified us via e-mail at Legal@CataliaHealth.com. We may for any reason, in our sole discretion and without notifying you, terminate your account. Grounds for such termination may include (i) extended periods of inactivity, (ii) violation of the letter or spirit of this Agreement, (iii) fraudulent, harassing or abusive behavior or (iv) behavior that is harmful to other users, third parties, and the community ethos of our Platform or our business interests. In the event that we terminate your account, you may not register for the Platform again without our express permission. If you believe that any action has been taken against your account in error, please contact us at the number provided to you in the one-page insert you received with the Mabu WCR. In addition, if we believe, in our sole discretion, that a violation of this Agreement or any illegal or inappropriate behavior has occurred, we may take any other corrective action we consider appropriate. We will investigate suspected violations of this Agreement or illegal and inappropriate behavior through the Platform. Please note that we will fully cooperate with any law enforcement investigation or court order ordering us or directing us to disclose the identity, behavior or activities of anyone believed to have violated this Agreement or to have engaged in illegal behavior. You may request termination of your account at any time and for any reason by sending an e-mail to Legal@CataliaHealth.com. Any suspension or termination of your account shall not affect your obligations to us under this Agreement (including but not limited to ownership, indemnification, any representations and warranties made by you, and limitation of liability), including all those obligations, which by their sense and context are intended to survive the suspension or termination of your account. We do not warrant or guarantee that the Platform will function with your mobile or computing device or be compatible with the hardware or software on any particular devices. Information will be transmitted over a medium that will be beyond our control and jurisdiction; multiple factors, including network availability, may affect alert or notification delivery or otherwise interfere with the operation of the Platform. We do not warrant or guarantee against, and therefore assume no liability for or relating to, any errors, omissions, delays, failures, interruptions, or corruption or loss of any data, alerts, notifications or other information transmitted in connection with your use of the Platform, particularly relating to any failure of the reminder system to function as expected, including but not limited to the non-delivery of any alerts or notifications. Without limiting the foregoing, we, our licensors, and our suppliers make no representations or warranties about (1) the availability, accuracy, reliability, completeness, quality, performance, suitability or timeliness of the Platform, Content, including software, text, graphics, links, or communications provided on or through the use of the Platform; or (2) the satisfaction of any government regulations requiring disclosure of information on prescription drug products or the approval or compliance of any software tools with regard to the Platform. We have no obligation to provide technical support or maintenance for the Platform. At any time and for any reason, without notice or liability, we may modify or discontinue the Platform or any part of it or impose limits on your use of or access to the Platform. Although we take reasonable measures to keep the Platform free of viruses, worms, Trojan horses or other code that contain destructive properties, we do not warrant or guarantee that files available for downloading through the Platform will be free of such contaminations. If you submit any information to us through or related to the Platform or send us any business information, feedback, idea, concept or invention to us by e-mail, you represent and warrant to us that such information is not confidential and that you have all necessary permission to submit or otherwise make available such information. In addition, you grant us a royalty-free, perpetual, irrevocable, world-wide nonexclusive license to use, reproduce, create derivative works from, modify, publish, edit, translate, distribute, perform, and display the communication or content in any media or medium, or any form, format, or forum now known or hereafter developed, including the right to sublicense through multiple tiers of sublicenses. you will not post or transmit any Content that is (or reasonably should be understood to be) libelous, defamatory, obscene, offensive (including material promoting or glorifying hate, violence, or bigotry or otherwise inappropriate to the community ethos of the Platform). You agree not to interfere or attempt to interfere with the proper working of the Platform or to disrupt the operations or violate the security of the Platform. Violations of system or network operation or security may result in civil or criminal liability. We will investigate possible occurrences of such violations, and we may involve and cooperate with law enforcement authorities in prosecuting anyone involved with such violations. You agree to comply with all user responsibilities and obligations as stated in this Agreement. Non-enforcement or our failure to act with respect to a breach by you or others of this Agreement does not constitute consent or waiver, and we reserve the right to enforce such term at our sole discretion. No waiver of any breach or default hereunder shall be deemed to be a waiver of any preceding or subsequent breach or default. Nothing contained in this Agreement shall be construed to limit the actions or remedies available to us with respect to any prohibited activity or conduct. or violate any applicable law, rule or regulation. 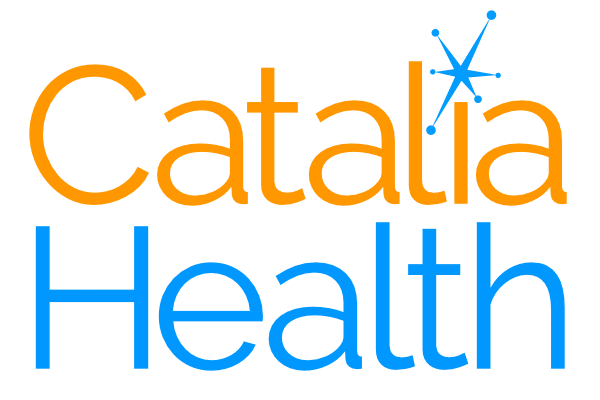 Catalia Health and its licensors own the Sites, Documentation and Platform, including any material or Content made available through the Platform, including our proprietary algorithms, and all worldwide intellectual property rights in the foregoing. Except as expressly permitted herein, you may not copy, further develop, reproduce, republish, modify, alter download, post, broadcast, transmit or otherwise use any material made available in the Platform. You will not remove, alter or conceal any copyright, trademark, service mark or other proprietary rights notices incorporated in the Platform. All trademarks are trademarks or registered trademarks of their respective owners. Nothing in this Agreement grants you any right to use any trademark, service mark, logo, or trade name of ours or any third party. Under the Digital Millennium Copyright Act of 1998 (the “DMCA”), it is our policy to respond to copyright owners who believe material appearing on the Platform infringes their rights under US copyright law. We accept no responsibility or liability for any material provided or posted by a user. If you believe that something appearing on the Platform infringes your copyright, you may send us a notice requesting that it be removed, or access to it blocked. If you believe that such a notice has been wrongly filed against you, the DMCA lets you send us a counter-notice. All notices and counter-notices must meet the DMCA’s requirements. We suggest that you consult your legal advisor before filing a notice or counter-notice. Be aware that there can be substantial penalties for false claims. It is our policy to terminate the accounts of repeat infringers in appropriate circumstances. Send notices and counter-notices to legal@CataliaHealth.com. TO THE MAXIMUM EXTENT PERMITTED BY APPLICABLE LAW, UNDER NO CIRCUMSTANCES AND UNDER NO LEGAL OR EQUITABLE THEORY, WHETHER IN TORT, CONTRACT, STRICT LIABILITY OR OTHERWISE, SHALL WE, OUR AFFILIATES, OR ANY OF OUR OR THEIR EMPLOYEES, DIRECTORS, OFFICERS, AGENTS, VENDORS OR SUPPLIERS BE LIABLE TO YOU OR TO ANY THIRD PARTY FOR ANY PERSONAL INJURY, INCLUDING DEATH, OR FOR ANY INDIRECT, SPECIAL, INCIDENTAL OR CONSEQUENTIAL LOSSES OR DAMAGES OF ANY NATURE ARISING OUT OF OR IN CONNECTION WITH THE USE OF OR INABILITY TO USE THE PLATFORM, INCLUDING, WITHOUT LIMITATION, DAMAGES FOR LOST PROFITS, LOSS OF GOODWILL, LOSS OF DATA, WORK STOPPAGE, ACCURACY OF RESULTS, OR COMPUTER OR DEVICE FAILURE OR MALFUNCTION, EVEN IF A REPRESENTATIVE OF OURS HAS BEEN ADVISED OF OR SHOULD HAVE KNOWN OF THE POSSIBILITY OF SUCH DAMAGES. IN NO EVENT WILL WE BE LIABLE FOR ANY DAMAGES IN EXCESS OF ONE HUNDRED DOLLARS ($100). In addition to the foregoing, we assume no responsibility for any error, omission, interruption, deletion, defect, delay in operation or transmission or communications line failure. We are not responsible for any problems or technical malfunction of any telephone or cellular phone network or lines, computer online systems, servers or providers, computer equipment, software, failure of any e-mail due to technical problems or traffic congestion on the Internet or on the Sites, including any injury or damage to users or to any person’s mobile device or computer related to or resulting from participation or use of the Platform. Some jurisdictions do not allow the exclusion of certain warranties or the limitation or exclusion of liability for certain damages. Accordingly, some of the above limitations and disclaimers may not apply to you. To the extent that we may not, as a matter of applicable law, disclaim any implied warranty or limit liabilities, the scope and duration of such warranty and the extent of our liability will be the minimum permitted under such applicable law. Any claims arising in connection with your use of the Platform must be brought within one (1) year of the date of the event giving rise to such action occurred. Remedies under this Agreement are exclusive and are limited to those expressly provided for in this Agreement, even if the applicable remedy under this Agreement fails of its essential purpose. You agree to defend, indemnify, and hold us harmless including our officers, directors, employees, agents, subcontractors, licensors and suppliers, any of our affiliated companies or organizations, and any successors, assigns or licensees, from and against any claims, actions or demands, damages, losses, liabilities, judgments, settlements, costs or expenses (including attorneys’ fees and costs) arising directly or indirectly from or relating to a) the breach of this Agreement by you or anyone using your computer, mobile device, password or login information; (b) any claim, loss or damage experienced from your use or attempted use of (or inability to use) the Platform; (c) your violation of any law or regulation; or (d) any other matter for which you are responsible under this Agreement or under law. You agree that your use of the Platform shall be in compliance with all applicable laws, regulations and guidelines. This Agreement is effective until terminated by either you or us. You may terminate this Agreement at any time, provided that you discontinue any further use of the Platform. If you violate this Agreement, our permission to you to use the Platform automatically terminates. We may, in our sole discretion, terminate this Agreement and your access to any or all of the Platform, at any time and for any reason, without penalty or liability to you or any third party. In the event of your breach of this Agreement, these actions are in addition to and not in lieu or limitation of any other right or remedy that may be available to us. Upon any termination of the Agreement by either you or us, you must promptly turn off and cease using the Mabu WCR, cease using the Platform and destroy all materials downloaded or otherwise obtained from the Platform, all Documentation, and all copies of such materials and Documentation. The following provisions survive the expiration or termination of this Agreement for any reason whatsoever: Disclaimers, Ownership, Limitations on Liability, Indemnity, Choice of Law and Forum, Entire Agreement and Severability. ATTN: Catalia Health Privacy Questions. Notice shall be deemed given when notice is posted on the Platform or when the e-mail is sent, unless the sending party is notified that the e-mail address is invalid. Unless the regular mail is returned to the sender, notice shall be deemed given three days after the regular mail is sent, in the case of domestic mail, or seven days after the regular mail is sent, in the case of international mail.